When you first learn you need oxygen therapy, you might wonder, “What is the best portable oxygen concentrator and how can I ensure I have portable oxygen when I need it?” Inogen portable oxygen concentrators are unparalleled in their reliability, and the company has the history, awards, accreditations and ratings to demonstrate their dependability. Moreover, Inogen’s high quality oxygen concentrators are backed by first-rate customer service. Inogen’s mission is to improve the quality of life for those receiving oxygen therapy. Whether you rent or purchase, Inogen offers the smallest portable oxygen concentrator to help you see the biggest improvement in your freedom, independence and mobility, even as you receive oxygen treatment. Directly purchasing is the quickest and easiest way to get an Inogen One oxygen concentrator. 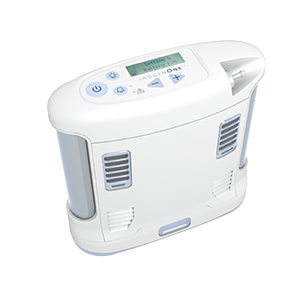 You can buy a portable oxygen concentrator for sale now directly from our website by clicking the link below, or call us at 1-800-695-7915 to talk to one of our oxygen specialists. Inogen is here for you every step of the way. Inogen has dedicated case managers to give you personal attention and work with you throughout the entire process. If you are interested in trying the smallest portable oxygen concentrator on the market, the Inogen One G4 is the right choice for you. Get your freedom back today with a personal oxygen concentrator! Many insurance plans, including Medicare, will cover up to 80% of the cost for your oxygen therapy equipment, provided your test results show that you require oxygen therapy. 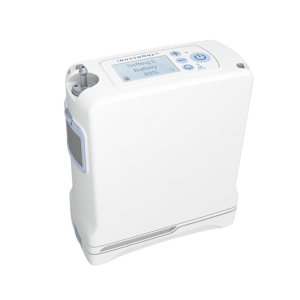 Since Medicare’s coverage policies vary slightly from region to region, and private insurance coverage can also vary from company to company, Inogen will work directly with your doctor, Medicare, and your insurance company to see if an Inogen One G3 portable oxygen concentrator rental is right for you. First, we’ll check your portable oxygen concentrator rental eligibility with Medicare or your Insurance Company. Call us at 1-800-695-7915. Next, if you’re eligible, we’ll work directly with your doctor to see if the Inogen One is right for you and obtain the required paperwork. Then, you’ll receive the Inogen One System and a backup oxygen supply. After you return the Medicare/Insurance paperwork, the last step is to remove your current oxygen equipment and to finally say goodbye to all those tanks. At that point you’ll be on service with Inogen and part of our growing family. Since the mid 2000s, Inogen has been the trusted name in portable oxygen concentrators. Our company was founded with the mission to help improve the lives of those on supplemental oxygen by helping to provide freedom, independence and mobility. We believe oxygen therapy should help patients reclaim their lives, rather than impeding it. With the help of Inogen portable oxygen concentrators, we hope to help patients live the active, healthy lives they want, without being tethered to a stationary system or worrying about refilling heavy oxygen tanks. With Inogen, you can continue to live your life and breathe better. Oxygen. Anytime. Anywhere. If you are wondering, “What is the lightest portable oxygen concentrator and how can I try one?”, let Inogen help. If you would like to try the Inogen One G4—the lightest and smallest portable oxygen concentrator available—purchasing from Inogen directly is the fastest and easiest way to get one. If this is your first time using oxygen therapy or a portable oxygen concentrator and you’d like to try one of our portable oxygen concentrators for a short time, or if you hope to have the costs covered by Medicare or other insurance, consider renting an Inogen One G3 to meet your portable oxygen needs. Whether you choose to rent or buy your portable oxygen concentrator, we’re here to help. Call us at 1-800-695-7915 and let our oxygen specialists help you make the right choice for your oxygen treatment. Inogen can help oxygen therapy fit into your life. Find out how today. * Co-payment and deductibles may apply. Inogen One G4 system not available through Medicare or insurance.